Toddler Sleep Problem: My Children are Sharing a Room and No One is Sleeping! Would you like to have me answer your toddler sleep problem question in my next video? If so, scroll down and submit your question in the comment section below. I will pick several questions a month to answer and post them here on the blog! Amy, I’m so glad you wrote in. I have lots of ideas to help you. Okay, first things first. If they just started sharing a room a week ago, is it possible to separate them while you work on this? Again, I don’t know all of the details of your situation but it might help if you could separate them temporarily while you work on this. Especially if Trevor was a good sleeper before you put Parker in the room with him. Its not really fair to Trevor if he used to sleep well and now his brother is sharing a room with him and keeping him up all night. So, that’s one idea. Let’s say you can’t separate them or Trevor is not sleeping well either. In other words, both of them have sleep problems and it’s not all Parker waking up Trevor. If that is the case, then you will have to do the Shuffle with them in the room together. Have a calming bedtime routine and create a sleep manners chart. I don’t think Trevor would understand the sticker chart but Parker definitely will. He might not like it but I would do it anyway. Put in the sleep manner chart the behavior you want to see more of. Go over it every night at bedtime and every morning in the morning. Review what he did and what he needs to work on. It’s all outlined in detail in my book, Good Night, Sleep Tight. I would also make sure that you create a new “rule” with Parker and you say, “You know what sweetie, you will have no more milk during the night and in our bedroom.” Or “From now on we are only going to have milk downstairs or with meals”. Tell him this during the day and more than once. He might be thinking “Yeah, yeah, you’ll change your mind, you’ll get it for me, you’ve done it before”. You might also want to tell him, “The doctor said there is no more milk in our room because we can’t go to sleep with milk on our teeth.” You can add that he can have some water before bed and if in the middle of the night he wants something to drink you can offer him the sippy cup of water that you have placed by his bed. No refills of water either or you will be doing that all night! My guess is that Parker uses warm milk, whether it’s in a bottle or a sippy cup, as a way to put himself to sleep at bedtime, too. Not that he has to go completely to sleep with a bottle or the cup in his mouth, but it’s making him drowsy, the actually sucking he may find soothing. That’s why you have to wean him off of it at the same time you address his sleep. Yes he will indeed ask for it during the middle of the night. You have to stay consistent and say, “There is your sippy cup of water. We’re all done milk.” And if he screams and wakes up his brother, I want you to stay calm and try not to react. I don’t want you to run and give him the milk because he screamed and woke up Trevor because guess what Parker will learn? “Aha! All I have to do is scream for warm milk and then mommy will go get it because she is upset that I woke Trevor up.” Not that is what his exact thought will be but he will get the gist of it. If you also have another parent who can help you out, I would divide and conquer so that when Parker wakes up, one parent goes to Parker and one parent goes to Trevor. Calm them each down by offering physical and verbal reassurance without giving in to any of Parker’s temper tantrums and without doing anything to them or for them to put either one of them back to sleep. Though it can take a little bit longer when they share a room and when they’re older and their patterns are more established, it’s not impossible if you stay consistent. I have worked with many siblings sharing a room and it absolutely works! If you have any thoughts or words of support for Amy please feel free to click the “reply” link under this article and leave a comment or question. My sons, ages 3 and 2 share a room. Splitting them is not an option. They both sleep through the night very well. The probem is they wake up early in the morning. They normally go to bed between 9 and 10, mostly closer to 10. They usually give me no trouble at all when being put to bed. The problem is the 3 year old has started this new pattern of waking at 6:30 a.m. Their normal waking time is about 9 a.m. or a little after. I lock them in their room. It is a safe place, so I don’t mind so much if they are up a little earlier than expected. But, I know this is not enough sleep for them, and I am not ready to be up either. I have tried letting them play it out, but they are just tired and grumpy from lack of sleep. I have resorted to taking the youngest down stairs to sleep in his playpen. They both go back to sleep and I do as well, but the youngest will soon be too big for his playpen. Also, he does not like it as much as being in his bed and has started complaining. I don’t blame him. It’s not fair that he has to move when his brother is the problem. I have a room darkening shade on their window, so the sun gets in, but it isn’t terribly bright. Thanks for any helpful advice. Although this may not be the answer that you want to hear, your children are waking at a biologically appropriate time-you may need to considering moving their bedtime earlier to between 7:00 and 8:00 p.m. For more information about typical toddler sleep schedules, this post is very helpful. To read more about early rising, you may want to review this article: Rise & Shine: Tips to Combat Early Rising. In the article, Kim points out that rising between 6-6:30 a.m. is completely normal for children your sons’ age. 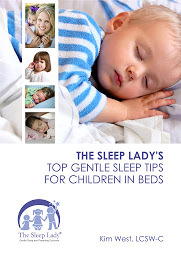 Another great resource is The Sleep Lady Facebook Page. There is a Certified Gentle Sleep Coach who can answer your questions and perhaps help you a bit further. cherbatbush Although this may not be the answer that you want to hear, your children are waking at a biologically appropriate time-you may need to considering moving their bedtime earlier to between 7:00 and 8:00 p.m. For more information about typical toddler sleep schedules, this article will help: http://www.sleeplady.com/baby-sleep/typical-sleep-schedules-recommended-hours-of-sleep. To read more about early rising, you may want to review this article: http://www.sleeplady.com/baby-sleep/rise-shine-the-early-waking-toddler. In the article, Kim points out that rising between 6-6:30 a.m. is completely normal for children your sons’ age. Another great resource is The Sleep Lady Facebook Page: http://www.facebook.com/thesleeplady. There is a Certified Gentle Sleep Coach who can answer your questions and perhaps help you a bit further.